You can buy squash strings easily and quickly at Squashpoint. Most rackets are equipped with good original strings and usually you can wait to replace them until it becomes necessary. However, the type of strings that you need depends on the standard you play at. The strings also affect the characteristics of the racket. For example, if you want more comfort and control, we recommend you to try out the green Tecnifibre 305 string which is widely considered the best squash string on the market and many professional players opt for it. 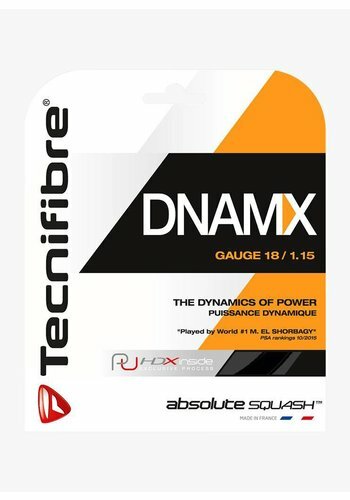 Naturally, different players have different preferences and priorities; if what you look for is more power, you can try the Tecnifibre DNAMX. The cheaper rackets tend to come pre-strung with synthetic strings that have a longer lifespan but are not quite as comfortable to play with. In the more expensive squash strings softer plastics are processed, and this improves the playing characteristics. The thickness of the string directly affects its lifespan. The thicker the string, the more durable it is. In addition to the material and thickness, another important factor that affects the playing characteristics of the racket is the string tension. If you choose a high tension, you have more precision and control while a low tension provides more power. When re-stringing with a lower tension, the strings can move up and down more freely, which in turn results in more ball acceleration. It is a matter of trying out different tensions to find the one that suits you best. 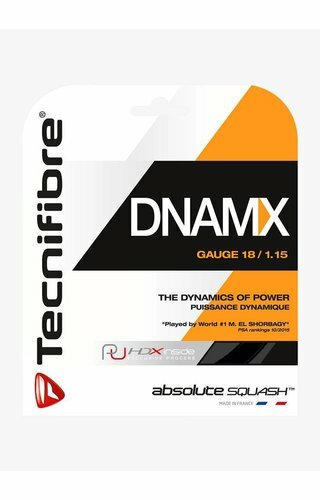 Tecnifibre has been producing the best replacement strings for years. We believe that what you deserve is the best quality and that is why we have chosen to offer squash strings of this brand only. More power with this thinner string! The ultimate string for squash! 200 meters of the number one squash string. Even more power with this thinner string. A string for maximum power. A string for maximum power and shock absorption.